The political right is not only cracking down on academic freedoms, but has started simultaneously to become a fierce advocate of an aggressively anti-intellectual freedom of speech. 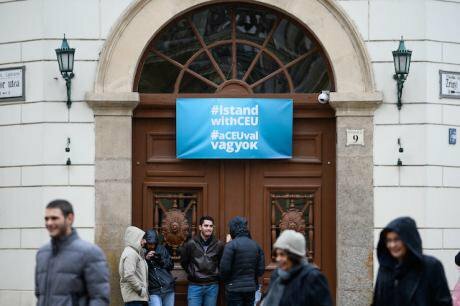 The embattled Central European University in Budapest, November 24, 2018. Omar Marques/Press Asociation. All rights reserved. The Central European University (CEU) will move their main campus to Vienna. It has appeared inevitable for a while now due to a crackdown and targeting by Hungary’s far-right prime minister, Viktor Orbán. Yet, the significance and repercussions of this fact are profound and remind us that academic freedom is not only under attack in places far away from home. My own area of interest, gender studies, has been particularly targeted not only in Hungary but more widely in anti-gender studies movements and lobbies, including in Germany where we have also seen the rise of the extreme right. Until quite recently, academic freedom, or rather the absence thereof, was something other people had to struggle with. Based in London, where I have been working at what is probably the most radical and progressive institution of higher education within the UK, I generally felt privileged and confident in my academic freedom. Meanwhile, I was acutely aware that colleagues elsewhere, mainly those researching and teaching in the Middle East, but also academics working in Middle East Studies in the US, were challenged by many different forms of encroachment on and violations of their academic freedom. In some extreme cases, such as those of my colleagues, friends and family in Iraq during the Ba‘th regime, it was not merely a matter of working in the context of severe censorship and political pressure, but Iraqi academics actually endured a struggle to stay out of prison cells, or even worse, to avoid execution. All these years, I assumed that my role was to be that of expressing solidarity, raising consciousness about the plight of my colleagues, and facilitating refuge. More recently, we have seen those extreme pressures reach the UK in the case of Matthew Hedges, imprisoned for over 6 months in the UAE, accused of being a British spy. And the devastating case of Cambridge PhD student Giulio Regeni, brutally murdered in Egypt, that still haunts many of us. Nowadays, however, academic freedom has become a real issue within British higher education in general, as well as within SOAS, University of London, the institution I have been attached to for the past 11 years. Academic freedom is acutely under threat, and violated, but also instrumentalised and twisted in a most bizarre manner. Certainly, the consequences and symptoms of these encroachments and manipulations are not comparable to what colleagues are enduring in the worst-offending places, for example, to what we have been witnessing in Turkey under Erdoğan in recent years. Yet, it is important to recognise that something significant has shifted and has affected our understandings of and debates about academic freedom in the UK. This shift within British higher education relates to wider changes within the political landscape in Britain and more broadly in western contexts. It is characterised by the securitization of migration, borders and ideas, the growth of racism, Islamophobia, and wider xenophobia as well as the broader increase and normalization of right wing voices, organizations and movements. More specifically, research, teaching, publications and academic debate in the UK have increasingly been under scrutiny and restricted due to the introduction in 2015 of what has been called ‘the Prevent Duty’, a set of rules and guidelines that are part of wider anti-terrorism legislation. Broad definitions of extremism seem to be linked to equally imprecise definitions of “terrorism”, “non-violent extremism”, “radicalisation” and “fundamental British values”. These definitions could be understood to mean that people who are, for example, critical of British foreign policy, are at risk of radicalisation and to suggest that academics and students accustomed to expressing personal views at university would need to be warned of the risks of discussing certain issues. But this is not correct, and universities should not let the imprecise and unclear language of the guidance draw them into placing unlawful restrictions on academic freedom and freedom of speech. (Scott-Baumann and Tomlinson, 2017). The University College Union (UCU), a large union of academics and professional staff working in higher education in the UK passed a statement in 2015 setting out several objections to the Prevent Duty (UCU, 2015): [it] seriously threatens academic freedom and freedom of speech; the broad definition of terrorism will stifle campus activism; the intention to force union members to be involved in the racist labelling of students is unacceptable; the Prevent Agenda will force union members to spy on learners, is discriminatory towards Muslims, and legitimises Islamophobia and xenophobia, encouraging racist views to be publicised and normalised within society; the monitoring of Muslim students will destroy the trust needed for a safe and supportive learning environment and encourage discrimination against BME and Muslim staff and students; and the Prevent agenda will help racist parties such as UKIP to flourish. The Prevent Duty is generally only applied in relation to speakers and events linked to Islam and Palestine-related speakers, with the latter more specifically those supporting the Boycott, Divestment and Sanctions Movement (BDS) against Israel. Right wing speakers and organizations promoting nationalist sentiments and policies, racism, Islamophobia as well as homophobia and transphobia not only seem to be excluded from the idea of spreading extremist ideas, but are ironically protected by the current government. In this wider context, SOAS has been particularly singled out within the media and by think tanks of a specific political persuasion. The right wing Henry Jackson Society, for example, issued a report in 2017 listing all universities who were supposedly in breach of the Prevent Duty for hosting extremist speakers. SOAS allegedly hosted more extremist speakers than any other university in the UK. However, when examining the 14 events that took place at SOAS in 2016/2017 listed in the report, many refer to prayer meetings, events organised by the Islamic Society or discussions around Palestine (Black, 2017). While most events were hosted by a student group working under the auspices of the student union, some events, especially those linked to Palestine-related issues have been organised by academics. So far, it needs to be stressed, that the violations of academic freedom which have ensued at universities in the UK and which have mainly involved the cancellation of events or imposition of control over their format, as well as instances of censorship in terms of content – have mainly emerged due to university management giving in to pressure from political lobbying groups or the media, as opposed to overt pressure exerted by the government. A number of incidents together illustrate how academic freedom has been concretely under threat in the UK. Aside from cancelling meetings deemed to be too contentious and provocative, university managements have replaced panel chairs shortly before ‘controversial’ meetings. The two most high profile cases, at the London School of Economics and Political Science (LSE) and University of Cambridge took place in November 2017 in relation to panels about Palestinian Rights, the BDS movement, and transnational solidarity. In both instances, the original chairs were deposed at the last minute by university management who gave in to external pressure. At LSE, management tried to implement the following guidelines: "At controversial events it is not prudent to have someone in the chair whose own views mean they may not be seen as a neutral chairperson"(Letter by LSE Academics, 2018). The university’s advice was strongly challenged by a group of LSE academics who signed a letter and started a campaign to counter its recommendations. Unsurprisingly, both academics who were deposed as chairs by management were women of an ethnic minority background. They were replaced by senior white male academics. The LSE female academic was of Turkish background but perceived to be unfit to chair neutrally due to her signing BDS statements. In the case of the University of Cambridge replacing a SOAS academic, her Palestinian heritage appeared to have contributed to the university’s decision, in addition to her support of BDS. An open letter signed by hundreds of academics criticised the decision by Cambridge University management, pointing out that much of the correspondence opposing the event and leading to the decision to replace the chair had originated in a well-known pro-Israel lobby group. The lobby group objected to the high profile panellists, including Palestinian activist Omar Barghouti and former President of the National Student Union, Malia Bouattia, the first black and Muslim woman to be in this role. Following the campaign objecting to the university’s decision, which involved not only an open letter but also a complaint sent by my SOAS colleague herself as well as supporting letters from senior colleagues at SOAS, the University of Cambridge’s management finally issued an apology, acknowledging that there was no evidence that her chairing would not have ensured a democratic debate (Mandhai, 2018). Both the University of Cambridge and LSE appear to have made a U-turn in response to pushback from academics. With reference to the successful campaign by LSE academics to challenge managements’ initial guidelines stressing the importance of ‘the neutral Chair’, Chalcraft states: "The new Code advances academic freedom here by removing the link between competence to Chair and beliefs and views. The School can no longer replace the Chair of an Event on the basis of the Chair’s beliefs. The School has accepted, and declared itself persuaded, by our core argument that the existing local regulations chill freedom of speech. It has changed the Code accordingly." Chalcraft stresses that collective action and concerted efforts allowed for the successful overturning of the university’s initial position and guidance. The new code, he states, is in line with ‘the new Higher Education and Research Act 2017, which establishes, among other things, e.g. at 14 (7) that staff are free to "question and test received wisdom, and . . . to put forward new ideas and controversial or unpopular opinions, without placing themselves in jeopardy of losing their jobs or privileges they may have at the provider." Academics in the UK are struggling to retain their academic freedom against outside pressures, mainly linked to right wing Islamophobic but also extreme pro-Israel lobbies. It has become apparent that collective action within institutions, but also national and transnational lobbying, can be successful in reversing what appear to be knee-jerk reactions by university managements. Meanwhile, the conservative government, particularly the Minister for Universities, Science, Research and Innovation, has taken it upon itself to make academic freedom central to their policy and rhetoric. However, perhaps predictably, the Minister and other conservative politicians have not been concerned about the potential impact of the Prevent Duty and right wing pressures on academics and students, but are worried about free speech being curtailed by ‘no platforming’ pressures at universities. In a most recent twist of the government’s mission to defend academic freedom in British universities, the former Minister of Universities Sam Gyimah, condemned students and academics at Oxford who protested when a portrait of Theresa May, the Prime Minister of the UK was added to an exhibition within the School of Geography and the Environment intended to inspire the next generation of female geographers (Weale and Elgot, 2018). Students and staff appear to have been incensed by the lack of consultation and questioned the appropriateness of including the portrait of May. As Prime Minister of a conservative government that has been instrumental in implementing severe cuts to higher education, is promoting immigration control and a fear-mongering discourse around refugees and asylum seekers, while leading a party set on Brexit, May has become an extremely controversial figure. Yet, the Minister of Universities used the protest as another occasion to criticise ‘no platforming’ voices, agendas and movements at universities. In 2017, his predecessor, Jo Johnson, brother of Foreign Secretary Boris Johnson, threatened to hit universities who were banning homophobic or transphobic speakers with fines and sanctions. In an interview with Pink News, an LGBT+ newspaper, he stated that universities which fail to comply “could be fined, suspended or ultimately deregistered” by the newly established Office for Students (Duffy, 2017). He further claimed that these new rules are needed “to protect freedom of speech” (ibid). Following in Johnson’s footsteps, Sam Gyimah, announced a year later that “When there are so many different interpretations of the rules, there is the risk that legal free speech will be stifled, either by well-intentioned but jittery managers, or by ill-intentioned wreckers” (Duffy, 2018). He continued stating: “A society in which people feel they have a legitimate right to stop someone expressing their views on campus simply because they are unfashionable or unpopular is rather chilling." (ibid). At face value, one might agree with his assessment that “there is a risk that overzealous interpretation of a dizzying variety of rules is acting as a brake on legal free speech on campus" (ibid). However, his enthusiasm for free speech is never linked to defending events that have been cancelled or subject to ‘neutral chair’ measures because of their perceived controversy in relation to Palestine/Israel. Nor does he seem to be defending Muslim students organizing prayer meetings or lecturers. Meanwhile, LGBTQ activists are concerned that the Minister’s attitude and future rulings, might enable speakers with homophobic and transphobic views to gain ground and platforms. While gender studies as a discipline has not been under attack in the UK as it has been in Hungary and elsewhere, it is apparent that conservative and heteronormative understandings of gender and sexuality are also key to right wing discourses and policies in the UK as well. We see extreme versions of the centrality of ultra conservative gender constructions in the way the Hungarian government, similar to many governments in the Middle East, try to replace gender politics with politics that revolve around the heterosexual family. Aside from the government’s inconsistent approach to freedom of speech, there is clearly a tension between the idea of freedom of speech as an absolute right and principle and the notion of hate speech. Although I have to admit that I see these distinctions as complex and blurry. "the moralism that is apparent in some courses and some student activism, the calls for “trigger warnings,” the insistence on the authority of their experiences by those whose minority status has silenced or marginalized them – who look to “safe spaces” as a way to gain traction in an otherwise hostile or neglectful institutional and social environment, who erupt in protests that are sometimes ill-considered violations of the rights they need to respect and protect." (Scott, 2017). While I share her concerns and view them as problematic, they do not justify the growing call by right wing constituencies to protect their freedom of speech. And here emerges a clear paradox and contradiction: the British government is critical of new generations of students being sensitive "snowflakes" "that should face reality and toughen up"; at the same time, the very same students "must be protected from radical ideas on campus." (Perfect and Scott-Bauman, 2017). "the real risks to free speech come, not from the ‘snowflake generation’, but from government-originated initiatives. Specific pressure is applied to Muslim student groups and those interested in the Middle East. Our on-going research appears to show that students and staff, Muslim and non-Muslim, are already self-censoring their discussions and activities as a result." (Perfect & Scott-Bauman 2017). The depiction of this specific situation, although clearly articulated in the context of the US, has many parallels with the growing encroachment and pressures by right wing politicians, media and think tanks in the UK. So far, the pressures in the UK have not been as ferocious and vile as in the US where the wider political divide seems to be even more extreme than in post-Brexit referendum Britain. Yet, Scott’s words above feel all too familiar. As I ponder my imminent move to leave London after 24 years to take up a position in the US, I am anxious about ideologically motivated and often rather polemic attacks on universities and academics. According to US Education Secretary Betsy DeVos, all university faculty, “from adjunct professors to deans,” are guilty of brainwashing college students. In a speech given at the Conservative Political Action Conference, DeVos accused academics of tainting students with “liberal ideology” (Jaschick 2017). While in my current world ‘liberal ideology” would be a derogatory term referring to conservative capitalist ideas, in DeVos’ and that of her government’s discursive horizon, ‘liberal’ seems to signify radical unpatriotic thinking. Yet, despite the attack on universities by the Trump administration, I take comfort in the fact that so many of my colleagues in the US have been at the forefront of speaking truth to power. Brown University in Providence, Rhode Island, which will be my new academic home, is also an excellent example to illustrate that academic freedom should not simply be equated with academic autonomy, although autonomy is, of course, a principle we have to defend. Trying to educate myself about our foremothers who fought for gender-based equality in academia, I am reminded of the struggle of Louise Lamphere, the professor who when denied tenure in the anthropology department at Brown in 1974, jointly with three other female colleagues, took the university to court. In an out of court settlement, the department was forced to reverse its decision not to grant Lamphere tenure, despite its argument that the decision was based on the department’s autonomy as a basic tenant of academic freedom (Porwancher, 2013). The out of court settlement established that transparency and the principle of equality were more important than the principle of autonomy. As we are joined in the struggle for academic freedom in different political and national contexts, we will have to negotiate the very principles that inform our respective conceptualizations and possibly recognise that there might be tensions and ambivalences in what we view as priorities. I grew up in Germany where I learnt very early on that following government orders, blind obedience and silence might actually mean complicity in crime and can lead to terrible atrocities. Very early on I learnt that it was important to develop an independent moral compass and to follow ethical principles rooted in the respect for human dignity rather than the rules of an authoritarian regime. So I was very happy and moved to see that over a thousand Turkish academics were courageous enough to sign a petition in January 2016 in order to distance themselves from the atrocities and crimes against the Kurdish population, particularly in south-eastern Turkey. Since then, academics in Turkey have paid a very high price for speaking out, and for daring to challenge the authoritarian regime. All over the world, it has been the role of intellectuals, educators and researchers to speak truth to power and not to be silent when injustice happens. Academic freedom has been integral to the development of the social sciences and the humanities historically and globally. Whenever academic freedom has been under threat, we know that a country is in big trouble: the attack on academic freedom has previously meant that a regime is failing to convince its thinkers with rational arguments as it needs to use coercive measures to maintain control. I knew this not only from my history teachers and readings about Nazi Germany, but while growing up and becoming educated in a relatively free environment, I became acutely aware of the severe restrictions on both freedom of speech and academic freedom posed on researchers, teachers, writers and intellectuals in Iraq during the Ba‘th regime. During my graduate studies in Cairo in the 90s, I also learnt, for the first time, about the complicity of a university management that has given in to external pressures and calls for censorship instead of defending the academic freedom of their staff and students. This became apparent when a colleague and friend of mine was forced to change his reading list at the American University in Cairo after a student, whose father had an important position in the military, complained about the content of some readings being un-Islamic. Instead of defending my friend’s choice of readings, the university management caved in and asked him to change the reading list while withdrawing copies of the book from the library. Historically, a regime lost legitimacy, respect and credibility, not only in the eyes of its own critical and thoughtful population, but also in the eyes of the global critical mass of people believing in democracy, justice and human rights. These days, however, the rules of engagement appear to have changed drastically. Across the globe, rationality and logic, however broad the political spectrum they were on previously, are being challenged by populism, fake news and so-called alternative facts. In this new age where social media insidiously threatens to eradicate our freedom of mind, and where polarised positions are fostered in ghettoised ideological bubbles, the principle of academic freedom is contested and manipulated to different political ends. All of a sudden, the political right is not only cracking down on academic freedoms in different contexts, but has started simultaneously to become a fierce advocate of freedom of speech, thereby not only engaging in aggressive anti-intellectualism but also giving space and platforms to ideas and practices that are counter to principles of equality and justice. Chalcraft, John (2018) ‘On ‘Neutral’ Chairs’, in BRICUP Newsletter 119, March 2018. Duffy, Nick (2017) Universities must allow anti-transgender speakers, in Pink News, 19 October 2017. Higher Education and Research Act 2017. Jaschick, Scott. 2017. “DeVos vs. the Faculty.” Inside Higher Education, February 24. Mandhai Shafik (2018) 'Cambridge apologises for blocking Palestinian from chairing talk’, Al Jazeera News, 6 March 2018. Porwancher, Andrew (2013) Prying the gates wide open: academic freedom and gender equality at Brown University, 1974–1977, Paedagogica Historica, 49:2, 273-292. Scott, Joan (2017) “On Free Speech and Academic Freedom’, in Journal of Academic Freedom, Vol. 8, 2017. Scott-Baumann, Allison and Hugh Tomlinson (2017) “Cultural Cold Wars: The risk of anti-‘extremism’ policy for academic freedom of expression’, Inform’s Blog: The International Forum for Responsible Media Blog. UCU (2015) ‘The prevent duty guidance for branches’. December 2015.